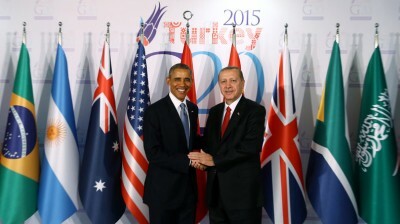 Russia’s defense ministry accused Turkish President Recep Tayyip Erdoğan [pictured left with US President Barack Obama] and his family of directly and personally benefiting from illegal oil smuggled through Islamic State-controlled territory in Syria and Iraq — and Russia has pictures that appear to prove it. “The son of Erdoğan, it seems, is the man who makes the export sales of ISIS-controlled oil possible. Though Erdoğan seemingly proffered this offer without any sense of irony, the global community collectively wondered if, as Zero Hedge put it, “the man who just finished starting a civil war just so he could regain a few lost seats in Parliament and who would just as soon throw you in jail as look at you if he thinks you might be a threat to his government,” could ever stick to such a promise. “Nobody has the right to slander Turkey by saying Turkey is buying Daesh [ISIS, Islamic State] oil,” Erdoğan asserted Wednesday from a university in Qatar’s capital, Doha. “Turkey is the main consumer of the oil stolen from its rightful owners, Syria and Iraq. According to information we’ve received, the senior political leadership of the country — President Erdoğan and his family — are involved in the criminal business. Maybe I’m being too blunt, but one can only entrust control over this thieving business to one’s closest associates. “They have invaded the territory of another country and are brazenly plundering it. Tanrikulu goes on to ask what those goods might be, should those shipments be proven true — and more importantly, if a conflict exists with Erdoğan’s own son being involved in trade with Syria and Russia in this way. What is perhaps most pertinent — and also most representative of the complexities rife in the Middle East imbroglio — is the extent to which Erdoğan knows about his son’s dealings, and precisely what those dealings might be. Wouldn’t such commerce with Syria’s Assad regime and Russia’s Putin administration directly contradict NATO’s support of member state, Turkey? After accusations had been cast between the two increasingly belligerent States in late November, Iraq had finally had enough, and on Wednesday, demanded a U.N. Security Council investigation of the “criminals” smuggling ISIS oil. “We don’t believe the Americans support Daesh,” said spokesperson for Iraq’s Ministry of Defense, Naseer Nouri.